I’ve seen a few of these types of posts recently and because I’m a nosey-bum and like taking a peek into other people’s lives I really like them, so I thought I’d share my own. You probably know by now that my the majority of my great loves in life are the simple pleasures, and an early night with a good book or magazine and a cup of peppermint tea is high on my list. 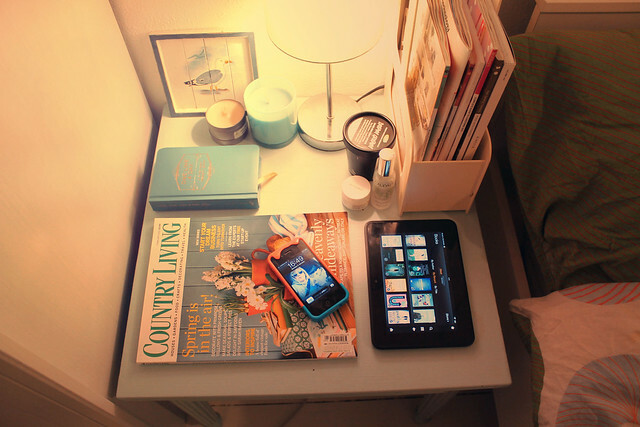 I used to have tons of magazines piled all over my bedside table as I subscribe to four – The Simple Things, Mollie Makes, Oh Comely and now Country Living too – so I recently moved them all into a magazine rack so they’re nice and tidy but I can keep all the latest issues within easy reach. I’ve actually not read Country Living before but I was given a subscription as a gift; this is my first issue and I love the Spring colours on the cover, it’s certainly helping me beat the post-Christmas blues. The Kindle Fire HD was a Christmas gift from Tom and I love it. It’s really nice to see all of my books on there (something about scrolling through the covers feels more accessible than the old Kindle) and I can keep up my naughty habit of reading blogs and checking Twitter before bed with much more ease than on my phone. 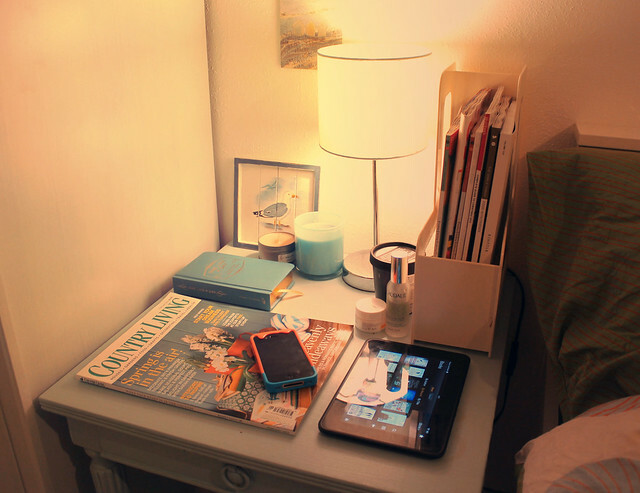 Of course my phone still has a place on my bedside table though, it’s never too far away from me! I’m currently reading a leadership book for work and trying out a few of the recent 99p Kindly Daily Deal purchases. I’m supposed to be reading The Slap for my book club but I’m 15% in and I absolutely hate it so I’m refusing! I never thought of keeping my mini Caudalie Beauty Elixir on my bedside table until I read Lily’s bedside table post and thought it was such a great idea. Now I give my face a spritz before bed and then put on the Dr. Hauschka Eye Balm – I think it’s a ‘day balm’ but it always makes my eyes feel soothed before bed. The Dream Cream is there as, now the tattoos on my feet and shins are in the healing stage they’re super itchy so I have some on my bedside table to keep them moisturised if they get dry in the night. I keep my One Line a Day Five-Year Memory Book on my bedside table in an effort to remind me to fill it in before bed but I’m terrible for remembering. Must do better with this this year! The only other things on my bedside table are my little wooden seagull picture and some scented candles to keep the bedroom smelling nice.